"This book will be remembered as one of the major collections of the decade." "…a satisfying sampler of solid stories from a team that rarely disappoints." 1. Use link below to buy from Amazon (Kindle edition). 2. Forward your Amazon receipt to Amazon@ArcManor.com. The receipt should clearly show the purchase of Soulmates (Kindle edition) between April 20th and May 20th. You may also download the invoice from your Amazon account (check under digital orders) and scan and email it as an attachment to the above email address. 3. Get a ONE TIME use coupon for $10.00 for use on any of our products (www.PhoenixPick.com). Valid for three months from date of issue and transferable. No minimum purchase or other restrictions. Must be used for purchase directly from Publisher (Phoenix Pick). You must use this link to purchase the book. An honest review of the book on Amazon would also be appreciated...thank you. 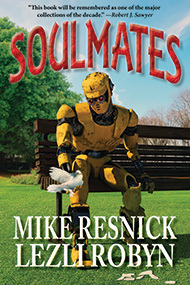 Multiple award-winning authors, Mike Resnick and Lezli Robyn, get to the heart of the matter in Soulmates, which showcases all the words they have penned together over their years as collaborators (with a bonus solo piece by each). Whether a robot, alien, some kind of supernatural being or human, rising above our prejudices and ignorance allows us to make emotional connections that can have a profound effect on our lives. Each of these stories examine a facet of the simple, yet incredibly complex, concept of companionship. They will make you laugh; will make you cry…but most importantly they will make you look at the very basic notion of soul-mates in a different light.